Echoes of the "Radio Ham"
The former vessel named Kelso was renamed Tianic and has since been dogged with bad luck. An off duty lifeboatman Mr Alex Evans from Aberystwyth was called by a friend Mark Corbett on his mobile to say he was on a sinking ship called Titanic. In this modern version of Tony Hancock's Radio Ham the SOS call came from the Caribbean 4,000 miles away. After writing down the vessel’s coordinates on the back of a receipt (with a pen/pencil that did not break), he contacted the local coastguard. US coastguards rescued the striken craft and it was towed to St Kitts. Kim Collins (1976– ) is a track and field sprinter from St Kitts & Nevis. He became the 100m champion at the 2002 Commonwealth Games with a personal best run of 9.98 seconds, breaking the 10-second barrier. A year later he became the World Champion in the 100 metres. He represented his country at the Summer Olympics on four occasions, from 1996 to 2008, and was the country’s first athlete to ever reach an event final. 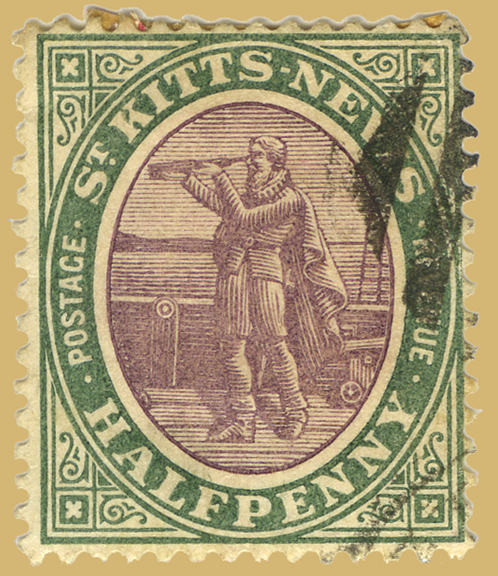 And a St Kitts & Nevis stamp issued in the early 20th century showing Christopher Columbus looking through a telescope – more than a century before that instrument was invented! Nevis is guaranteed the right to secede if its people want. The islands of St Kitts and Nevis are close enough for people to swim between.